With its magenta red double flowers, the Midland Hawthorn or Double Red Flowered Hawthorn (Crataegus laevigata 'Pauls Scarlet') makes for a real display of colour in late spring. An ideal choice for exposed gardens, but this tree is also able to cope with most garden situations. In particular, this would include small gardens in towns, close to busy roads. Its final height of 5m (16ft 8in) makes this an attractive choice for a small garden. 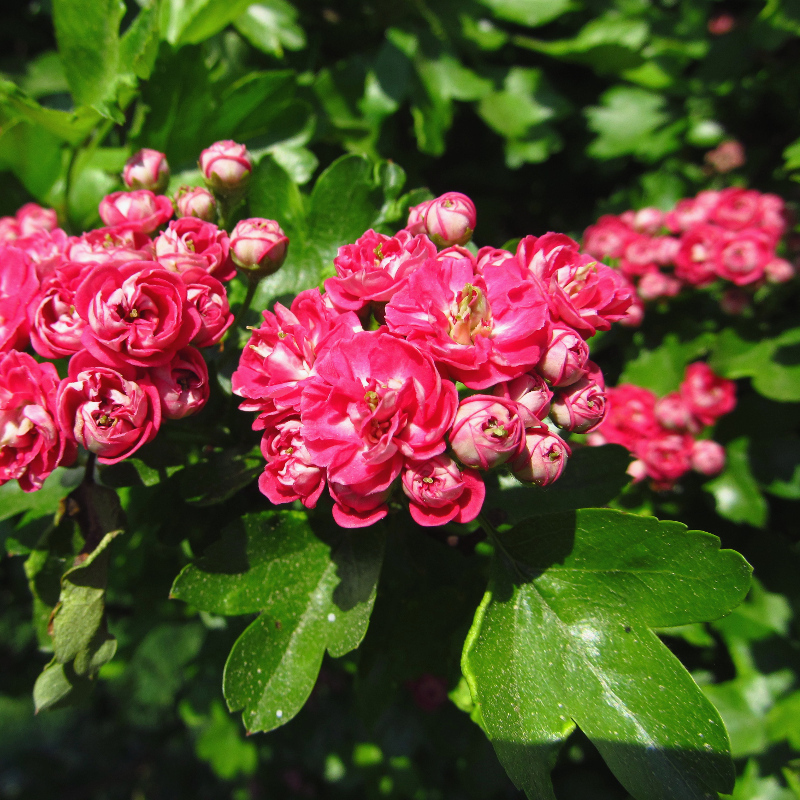 Our Double Red Flowered or Midland Hawthorn trees are supplied at a height of between 1.5m and 2.4m in a 12L container, which means that the tree can be planted any time of the year and with better results than either bare-root or rootballed trees. The height of the Pauls Scarlet tree you actually receive are based on several factors out of our control. These include the previous 2 years weather and Mother Nature in general. Some trees just refuse to grow up, a bit like some of the people working on this website! This does not make them any less healthy or desirable, just a bit shorter. On the plus side, shorter Pauls Scarlet trees are easier to prune, less leverage for the wind to cause damage and are a little bit cheaper. It is entirely possible the young Pauls Scarlet trees will grow to the same size as other Pauls Scarlet Hawthorne trees or go on to grow taller. In short juvenile heigh is no indication of mature height. We have included a picture on the left without foliage to show the framework of the tree. You will only receive a leafless tree in Autumn and Winter. If this needs explaining further, may we suggest you buy the artificial version. We have not chased anyone for a review of this tree yet but no doubt someone will say something nice soon.